Kid friendliness: lots of free samples and kid pleasing marshmallows, mochi and sprinkles! Everyone in LA has heard of Pinkberry. Maybe even heard of Red Mango, Yogurtland and the Frozen Yogurt Wars. But in Taipei, the frozen yogurt wave is just beginning... there were some attempts here and there, but none that really seemed that they would take off until now. A few years ago, I even daydreamed to open a Yogurtland-berry-ish froyo place here and eat free frozen yogurt whenever I wanted, the way I wanted, but luckily for us, the founders of YoFroyo actually went ahead and did it. YoFroyo is located in an alley off of the busy Shida Night Market, across from Subway. I would have never ventured there but for an email invitation letting me know about their Grand Opening. I couldn't make it then, but the call of tarty frozen yogurt (or fro yo, for short, hence the name YoFroYo) was too strong to let me wait too long to check it out. And I'm glad I did. First off, next time I'd come with an empty stomach to the Shida Night Market since there are so many alleys full of street eats to sample, such as "gua bao", pan fried dumplings, crispy fried chicken cutlets or "G-pai" and sausages, just to name a few. But if you are headed just for the frozen yogurt, you have a lot to choose from. There's an array of toppings, flavors and combinations. Most importantly, there were berries, or at least strawberries, and mango. They also have other confections- gummy bears, marshmallows, crumbled cookies, diced fruits, chocolate chips and even baby cream puffs to decorate your dessert. They also have freshly made baby mochi balls to choose from and quite a number of flavors (original, guava, taro, black sugar, blueberry, mango and lychee) to match whatever yogurt flavor you choose. The combinations ar endless. It's probably easier for locals to get the concept, since it's quite similar to picking and choosing your sweet toppings on shaved ice, which also comes in a plethora of colorful shapes and sizes. If you've never had Pinkberry, the whole phenomenon came from the frozen yogurt being tart and sweet, rather than just overly sweet. Being a "healthy" dessert with fresh fruits, Pinkberry was even nicknamed "Crackberry" for its addictiveness. From that sprung entrepreneurial copycats with a twist, such as Yogurtland, which provided "pay as you weigh" and self service with 8-12 flavors of froyo to choose from. YoFroYo borrows a few elements from each and makes it own hopes of an Asian franchise- a shiny and hip plastic white and silver decor, a range of six tart to sweet yogurt flavors that can appeal to all ages and tastebuds, and putting an Asian influenced spin to it. And it works. I really liked the green tea frozen yogurt with a dash of azuki red beans sample that I had. I liked the soft and squishy bite sized mochis that I tried. All the choices can be a bit overwhelming and with all the signs to read (thankfully in both English and Chinese), I was a little overwhelmed at what to order. But maybe most importantly, the portions are sizeable and the prices are great (perhaps a happy result of needing to be competitive with other night market eats and being near a university). A regular at NT$55 is totally shareable with 2 or 3 people, or large at NT$75 if you're really hungry. And if you're not a fan of the tart or fruit flavored frozen yogurt (they currently have original tart, mango, blueberry, lychee), then you can get chocolate. They even have a suggestion box for future flavors. I'd put a vote for peanut butter or strawberry, and white chocolate chips or yogurt chips toppings and of course, raspberry or blueberry toppings when they are in season. The founders are from UC San Diego and set on making it So-cal authentic. As the weather gets hotter and word of mouth spreads, I'm sure we'll see more signs of a Taipei Yogurt War. Maybe you can be the "cool" one in your group to help your friends discover tarty frozen yogurt the next time you're tired of shaved ice. What do you think? Is Taipei ready for tart froyo? Will you be checking it out? On paper, L'Idiot is a great addition to the growing brunch scene in Taipei. But after my latest visit to L'Idiot, I could see why the Diner has packed two locations and L'Idiot slowly fills until 1PM when it's mostly full. Not only do you get more bang for your buck at the Diner, but maybe brunch here at L'Idiot is a bit overly refined, rather than down home comfort food. This is my fourth or fifth visit (lost count) to L'Idiot's weekend only brunch, but my first time posting, only because each time I never managed to get pictures. And unfortunately, I think this latest visit is my least impressive. First- I ordered the mushroom and onion omelette (NT$300). But as I dug in, I noticed there wasn't any cheese. Zero. And what is an omelette without cheese? I had a faint recollection that the last time I had ordered an omelette there had been plenty of cheese. So I waved down the waiter and asked- she said only I must have ordered their ONE omelette with cheese last time (the classic French omelette, I think). The three other omelettes didn't include cheese. I wish the menu note it somehow, or the waiter could- since for me, the reason I order an omelette is for the cheese- so cheese lovers could request that it be added. Otherwise, I'd get poached eggs or something. And as silky and perfect looking as the omelette was, I personally prefer homemade-style omelettes. Egg without any milk or cream added in, as this one seemed to have. The French Toast that came to the table was cool- lukewarm at best. Do you see how the cinnamon butter isn't nearly melting on the surface of the french toast? We asked to have it reheated, which they did, but it came back piping hot like maybe it was microwaved, and soggy soft to the point of no repair. If you're really hungry, you can get the Super Deluxe, which is a good amount of food, but still a bit pricey for what you're getting at NT$620. Eggs, bacon, sausage, orange juice, tea or coffee, half a ham and grilled cheese sandwich, soup and salad and a dessert. Maybe if the dessert was more drool worthy and they dropped a couple hundred NT off the price. My favorite was probably the beef and egg breakfast burrito (NT$380), which was the first time I spotted it on the menu. I liked the flavors of the steak and mild spiciness of the salsa in the wrap, but it would have been perfect if there was more meat and a dash of guacamole, especially for the price. Of course, part of the higher prices you are paying for is the ambience, and the touches like complimentary ricotta bread appetizer and goody bag of cookies when you leave. I've also had the crabcakes egg's benedict in the past, and found it a bit mushy. The crabcakes were not crispy, nor were the english muffins toasted, so with the poached eggs, there was no satisfying contrast in textures. The cheeseburger with egg is not bad, but I disliked the overly bready and soft bun. I'd also avoid the chicken pot pie, which doesn't come with a baked crust, but a biscuit on the side instead- my friends and I tasted it and no one wanted seconds. My relatives (and maybe yours) preferred pasta dishes over a Western brunch and I had a taste and it's still good - seafood orechetta pasta and mushroom ravioli. We still love the lemon argula salad. So if you don't want to wait in line at the other brunch spots around town, then make your reservations at L'Idiot, especially if you have larger groups. L'Idiot is more spacious and comfortable for larger groups, and nicer atmosphere and presentation if you need to impress the relatives. While I still like the regular menu at L'Idiot, the brunch needs a few tweaks to be equally droolworthy. Kid friendliness: areas to lounge. friendly free samples. If you're jonesing for a good waffle, you should definitely give Big Tom's a shot... though it'll be covered with three scoops of ice cream and you'll more likely have it for afternoon tea than for breakfast. And the SYS Memorial Hall location is perfect for a leisurely afternoon tea. The outside seating overlooks the lake and the SYS Memorial Hall. If it's too hot or too many smokers, you can lounge in the cow-themed, homey cafe inside. You might pass by it a number of times without seeing it. It's a bit hidden by the greenery, but it's across the McDonald's on Kuang Fu, to the right of the entrance to the Sun Yat Sen Memorial Hall. My favorite is still the peanut butter, but all the flavors are I've tried are pretty awesome. Creamy, sweet, but not overly so. While it's not as exotic as Snow King Ice Cream, it's still a perfect place for those looking for something other than Haagen Daaz or Coldstone. But the waffle is goood... and you know how I love waffles! And ice cream! No.1, Lane 63, Sec. 7, Jhongshan N. Rd. No.219, Sec. 2, Chang-an E. Rd. I've never been, but I dropped by to check out some of my friends practicing for the Dragon Boat races this year. 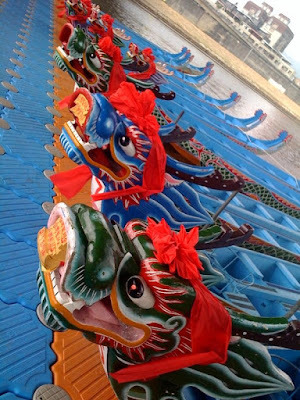 Seems pretty cool, so if you want to check it out- here is some info from taipeitravel.net. Thanks to reader Tina for asking, so that I did some googling and figured there might be others of you out there that would want to check it out. Race Location: Under the Dazhi Bridge at the Dajia section of the Keelung River in Taipei City (500 meters each way). And speaking of Dazhi... does anyone have any recommendations on where to eat in that area, besides in the Miramar Mall? Kid friendliness: benches and seats and ice cream! Sweet. Sour. Spicy. Savory. Snow King Ice Cream has any kind of flavor you'd want, and yes, it's ice cream. See the menu above? Carrot, Honey, Mustard, Curry, Chili Pepper, Mint, Tomato, Basil, Bitter Melon. Yup, still ice cream flavors. Not strange enough? There's also chicken, soybean curd, pork floss and pig's feet flavored ice cream. But don't let those unusual flavors scare you away if you're strictly a chocolate or strawberry. Snow King also does fabulous traditional flavors that tastes as if you were eating the essence of the fruits or flavors themselves. My favorite is peach, which has small chunks of icy peach inside, or recently, I tried guava, which tastes like melt-in-your-mouth guava. A much wider array of flavors are available than most of the chain shops in town- Snow King offers around 73 almost every day, and all of its ice cream is handmade by the shop, most using local ingredients. Seeing Snow King packed with students gasping in delight and clamoring to taste and share the various flavors they had ordered reminded me of the first time I came with a bunch of friends from the states five years ago. The store has a "no sample" policy, so if you want to give Taiwan Beer or Sweet Corn or Rose ice cream a try, you have to buy a scoop. Otherwise they'd probably go out of business giving away samples from curious visitors. Each flavor is priced differently and the prices are shown on the Chinese menu. They have an English menu upon request (but it doesn't have the prices on them). 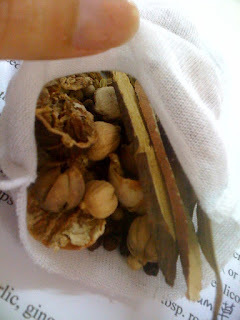 Most scoops run from NT$60-$100, but goes as low as NT$45 for Milk, Sesame or Mint and as high as NT$150 for Ginseng. It's also worth noting that one of their popular flavors- Taro- has been discontinued for a few years, much to the sadness of my visiting friend. Making each flavor into ice cream basically reduces it to its core notes of flavors- like my sister got Kiwi and it was a bit sour with the flecks of crunchy kiwi seeds throughout- especially since I took a bite of it after I ate my peach ice cream. Snow King Ice Cream is perfect to take a group of visiting friends after walking around nearby Ximending. It's basically across the street and a few blocks from the Ximen MRT, near the police station and Zhongshan Hall. I know you guys love desserts, so looking forward to hearing if anyone has tried some of the weirder flavors and what you thought! I'm a procrastinator... the one who didn't start typing up her paper until the night before it was due. So I'm sort of amazed, sort of proud of myself that I've been able to keep a relatively steady stream of posts through the years without any official deadlines. So in hopes of catching up to "real time" posts, here is a declaration and list of restaurants that I need to write up. Some have been sitting as drafts in my blogspot for years! So if you see any that you want to read about, let me know and I'll move it up to the front of the line. :) And if you want more instant gratification, then take a look at Twitter since I've been using Twitpic more often to take random food pics. Who else is eating shaved ice this weekend? Tai Yi is SO good! 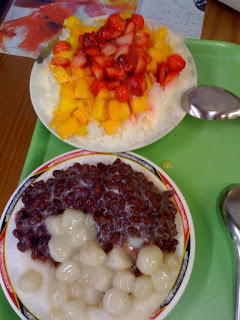 Though I much prefer their red bean and fresh mochi balls with condensed milk over the mango/strawberry here. For mango ice, you're better sticking to Ice Monster. But there seems to be a new crop of frozen yogurt places coming to Taipei. I'll hopefully get to check them all out and let you know! Anyone try Yogurt Art or Yofroyo yet? What would you rather have to beat the heat? Shaved ice vs good frozen yogurt? Kid friendliness: probably slightly healthier than the other snacks at the counter.. barely. Hard to tell from this picture what this is, but if you are into either sweet potatoes or sweet potato chips, you gotta try these. Randomly stumbled upon them in a glass case at the snack counter on the kids' floor at Mitsukoshi while shopping for a gift. For NT$50, you'll get a HUGE brown paper lunchsack sized bag of warm, slightly sugared sweet potato chips that you'll be crunching away until you have a stomachache... unless you have more self control than I do. Kid friendliness: high chairs and kids' dinnerware available. Having not been back to Bellini Pasta Pasta in quite a long time (maybe a year, or two? ), I was again pleasantly surprised at how it measured up to other Italian eateries I've been to since I first wrote about it. Although it's definitely more fusion Italian with a Japanese twist, there's a huge menu to please different tastebuds. This is evident by some of their options- a potato gratin with mentaiko cod roe appetizer or the spaghetti with "kinpira gobo," chicken and chili peppers or thin strips of seaweed atop a calamari, yuzu mentaiko pasta. But don't worry- those are just the extreme- there's still traditional carbonara, lasagna, seafood risotto, or pesto spaghetti. My favorite is still the Bolgonese with two soft boiled eggs (NT$390) (and it disappeared quickly from the bowl) with the sauce being slightly sweet and the runny egg giving the noodles an extra slippery texture. Bellini also has a pizza with a soft egg in the middle (but I haven't tried it, though I've tried it at Primo). I also really like that their serve the Caesar salad (NT$180) as a half romaine and is enough to share between four people. This time, they offered to cut it up for us. The dressing doesn't taste like standard out of the bottle dressing. For a little extra, you can add things like parma ham, smoked salmon or grilled chicken on top. One cool thing Bellini does is let you have 1/2 portions of two different pastas (NT$480) for a popular few selections, in case you want to just give it a try. In this case, I thought the chili flakes made the clam spaghetti too spicy for me, but the pork cutlet pasta was good- maybe too little as a half portion. The pizza was also better than I remembered- although it probably is best hot and not cooled down as it will if you get it as take-out. We got the number 5 mezzo e mezzo (NT$350) or half and half. The crust was thin and there wasn't a ton of cheese on the pesto side, but the crust had a nice balance between crunchy and soft. Bellini is a great option for a meal before the movie if you are Xinyi Vieshow or while shopping at Breeze Center. The atmosphere and menu works for a lunch date or a large group to share and taste a variety of different dishes.